Mum will love our bespoke Yummy Mummy pink tote bag. Mum will love our bespoke Yummy Mummy pink tote bag. 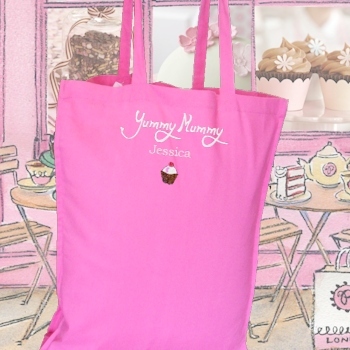 Pretty pink cotton gusset tote bag embroidered with Yummy Mummy slogan in white thread and a cute cupcake motif. Personalisation: In-between the Yummy Mummy Slogan and the motif we will personalise a name or initials in a thread colour of your choice. Please fill in the options box with the name you would like and select a thread colour for this. Bright pink tote bag measures 30x40cm with a 9cm gusset, made from 100% cotton and has a flat base and gusset edge for extra holding capacity. Great for shopping, books, hobby crafts, beach, days out, sports or dancewear.